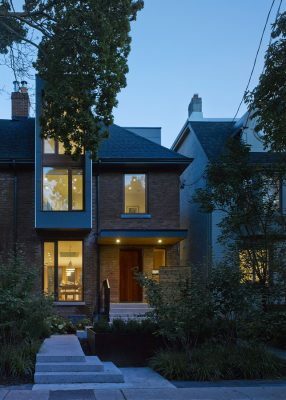 Located on a leafy street in midtown Toronto, this Edwardian-era house, built in 1913 of locally-made red brick, had a layout typical of its time that included a front living room, a larger dining area with a kitchen leading off it at the back, and several small bedrooms upstairs. The project included the complete renovation of the house from top to bottom to convert it into a modern, warm and light-filled space, open to both the sky and gardens in the front and back. The owners wanted a strong connection to the landscape and sky. The original house was devoid of light at its centre, and used traditional principles of privacy to separate, segregate, and enclose spaces. The new space was to be crisp and warm. 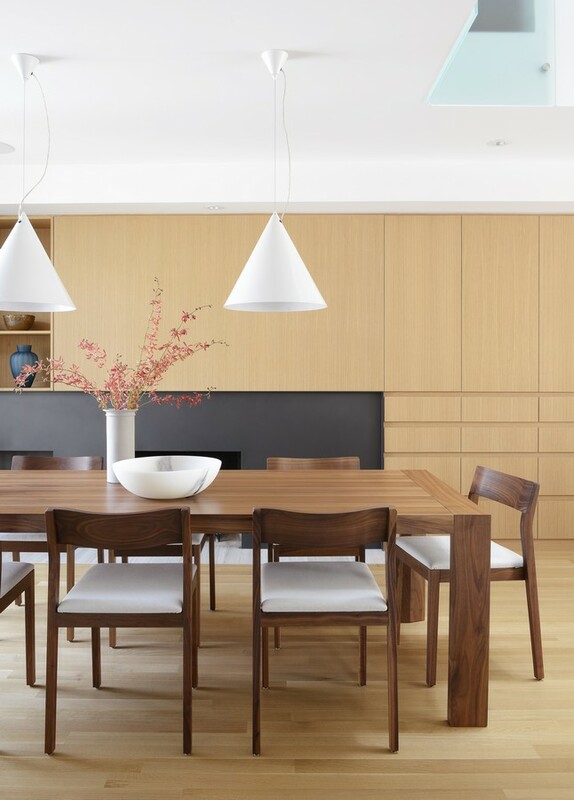 As avid cooks who regularly host dinner parties for friends and family, it was also important for the owners to have a flexible ground floor space that included dining and living areas, and a state-of-the-art kitchen. To bring in light and views, the architects added three dormers to the existing house, at the front, back and side. Oversized, and built in a modern idiom, the dormers give the facades crisp definition, and are polite nods to the traditional streetscape, tying the house to the neighbourhood. From within each of the dormers, the house feels as if it hovers in the trees. 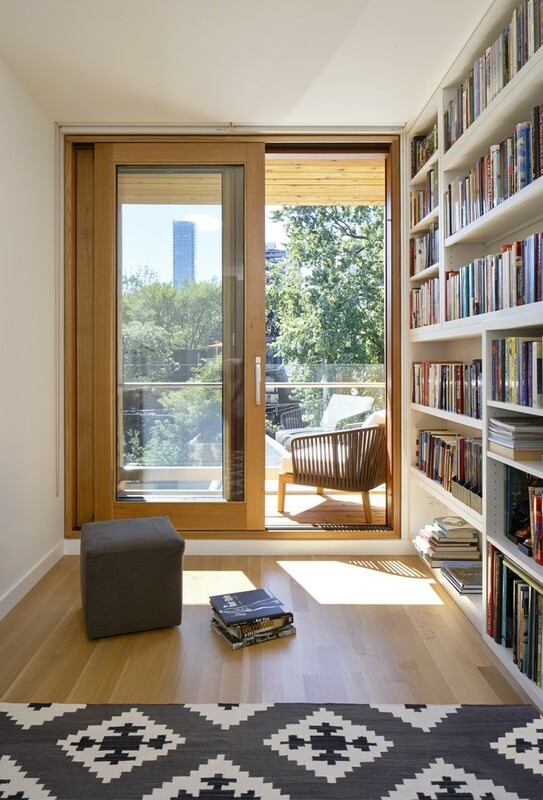 On the interior all of the small spaces were opened up, allowing them to drift gracefully into one another. 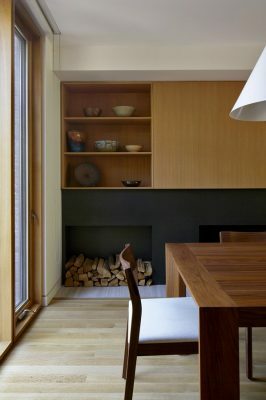 Opening up the kitchen area, and blending it with the dining and lounging spaces, allowed for the rear wall of the home to be completely glazed. The remainder of the house is essentially open, with pivot doors that can close off personal spaces or noise when desired. 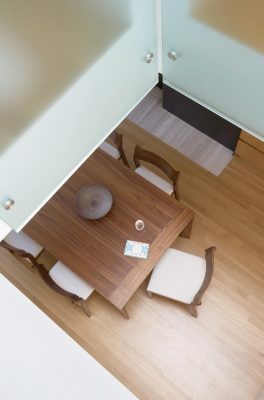 Wall sized partitions pivot or slide away and disappear when strict separation between spaces is not needed, and the more usual doors that remain are tall and wide. Because the divisions of interior area have been left versatile and variable, the attic, for example, can become a private living and working apartment; and it can easily be converted into a guest suite or retreat. 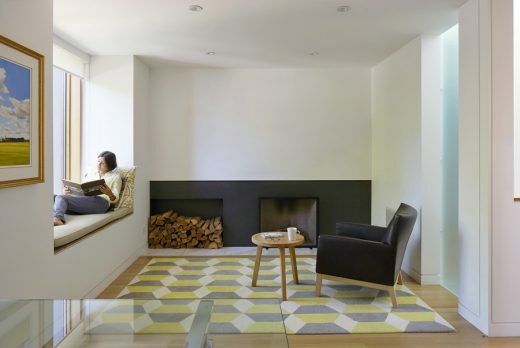 Every space in the house was to be refreshed using a contemporary aesthetic, and there was a particular emphasis on the interior spaces being light-filled, with a strong connection to the outdoors. 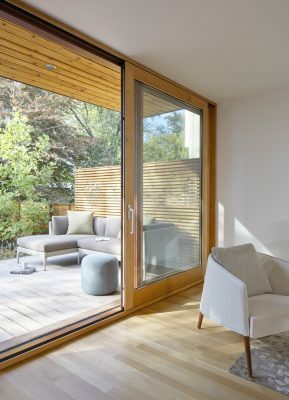 The darkness at the centre of the plan was addressed by carving a rectangular atrium that brings natural light from an opening in the roof downward, through the attic, past translucent panels on the second floor, and finally into the ground level, so that the warm wood interiors are bathed in natural light. The re-imagined exterior of the house is as crucial to the design as the interior living space. 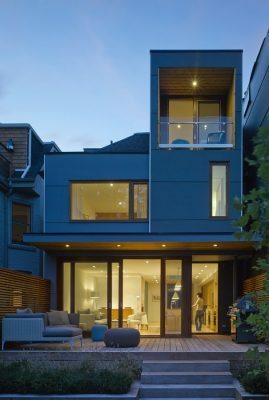 In the front, the previous landing was replaced with a tiered, poured-concrete porch, including a custom cedar bench complete with recycling and garbage storage. Moving to the rear of the house, a continuation of natural materials adds to its contemporary palette. The cedar deck and fencing provides warm and spacious additional living space complete with an overhang that shades its guests while seamlessly connecting the outdoor living space to the inside. This project establishes a method for substantially updating the Edwardian residential fabric of the city while maintaining the architecture’s contextual relationship to its neighbours.